Joanne Chu and Sadao Munemori Post 321 Adjutant Carl Miyagishima. 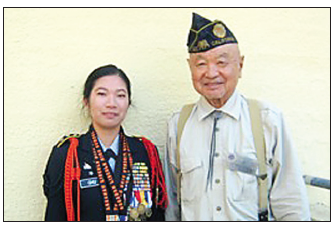 The American Legion Sadao Munemori Post 321 presented its 19th annual scholarship in the name and memory of Sadao Munemori to graduating senior Joanne Chu on April 27 at the Abraham Lincoln High School Junior ROTC awards ceremony in Los Angeles. Cadet Lt. Col. Chu is the battalion commander and plans to attend the University of San Francisco majoring in graphic design and journalism. Her other activities include editor of the yearbook, Academic Decathlon, long-distance track and field, Student Council, Environmental Club and animal shelter volunteer. Master Sgt. Gilberto Rosado, senior Army instructor, conducted the awards program. The JROTC color guards have held annual memorial ceremonies on April 5 for 1940 graduate Munemori at his Evergreen Cemetery gravesite in Los Angeles. On that day in 1945, while serving with A Company, 100th Battalion, 442nd Regimental Combat Team, in Seravezza, Italy, Munemori dove onto a grenade and saved two of his comrades. For his actions, he became the first Japanese American Medal of Honor recipient from World War II.